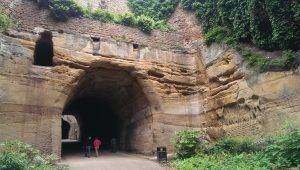 Nottingham is a mediaeval city that became wealthy during the nineteenth century through lace manufacture. 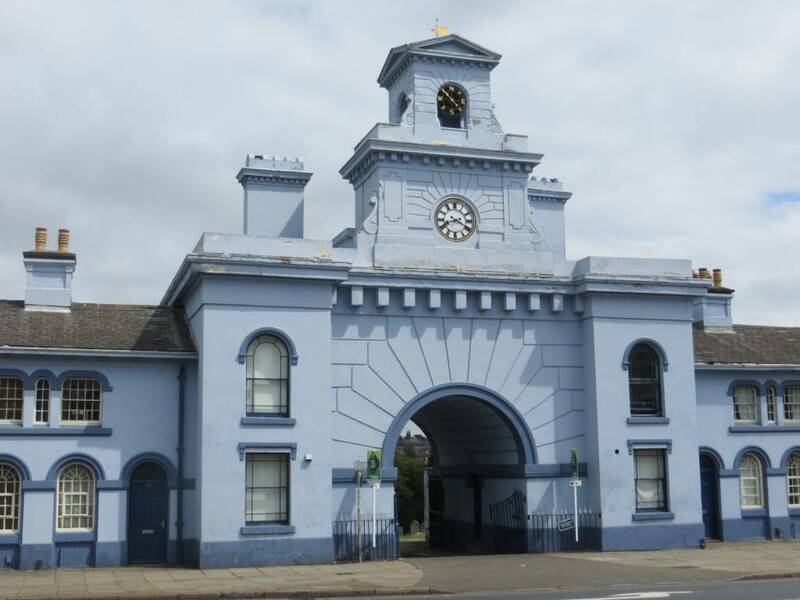 The quarter called ‘The Lace Market’, which is today full of bars, restaurants and design companies is where trade was carried out and garments created. 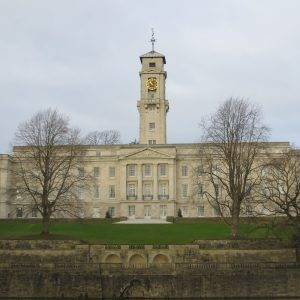 Nottingham had been widely known as a garden town in the eighteenth century but had grown in upon itself from the 1780s onwards as trade expanded, with very poor quality housing and sanitation. The much overdue Enclosure Act of 1845 finally released the pressure, allowing for expansion outside the city walls; and in the next forty years, the population tripled to 150,000. The good news was that at this time extensive provision was also made for green spaces. 120 acres were allotted to the corporation in trust for the people of Nottingham for public baths and walks, cricket and football grounds, and a cemetery. This was in line with the provisions of the Act, which reflected a growing recognition nationally of the health and recreational benefits of creating `green lungs’ in the industrial towns. Parliament had with great foresight adopted a standing order in 1839 that all future enclosure bills should make provision for open spaces for recreation. As a result, the Forest (just to the north of our walk) was largely preserved, the Arboretum was opened in 1852 and a number of ‘walks’ were created which effectively produced a ‘green collar’ around the town. A visiting journalist wrote of how the “recreation walks – which are, in truth, almost a continuous avenue of trees – completely encircle the town, and afford a promenade of ten miles in extent… a proportion of open space that is still envied by other cities”. These open spaces are still in existence today – Elm Avenue, Corporation Oaks, Robin Hood Chase, Queen’s Drive and the Forest – several of which our walk takes us along. As the landscape and the living conditions of the city improved, so there was also a drive for better education. A university was first established in 1875 with the help of an anonymous benefactor; and then the generosity of Sir Jesse Boot allowed it to move to its expanded University Park site in the late 1920s. This success is reflected today in a total student population of over 60,000 across two universities, which are consistently highly rated both by students and employers. 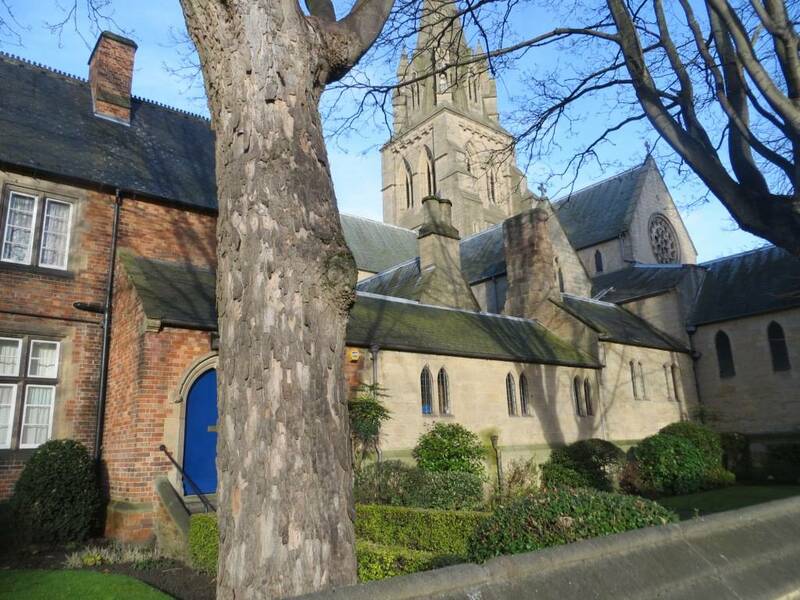 Our walk started at St Barnabas Roman Catholic Cathedral, first consecrated in 1844, fifteen years after the Catholic Relief Act ended most restrictions on Catholicism in the United Kingdom. 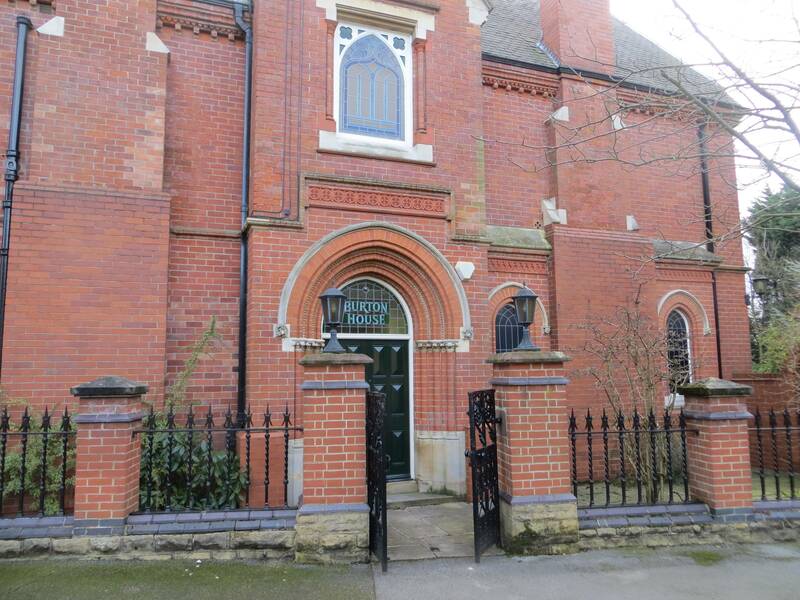 The building was designed in the Early English Plain Gothic style by the leading Victorian ecclesiastical architect Augustus Pugin, who also designed the interior of The Houses of Parliament. Next we passed the Nottingham Playhouse, built in the modernist style by Peter Moro who had worked on the interior design of the Royal Festival Hall in London. 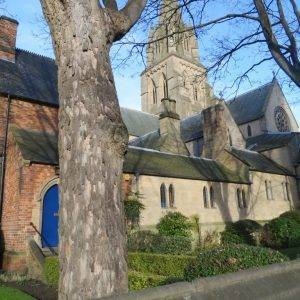 Being in such sharp architectural contrast to the cathedral and the surrounding red-brick villas, it caused quite a buzz of controversy when it was first built in 1963. During the 1980s, when the concrete interiors were out of fashion, the Playhouse was subject to ‘refurbishment’ that sought to hide its character. 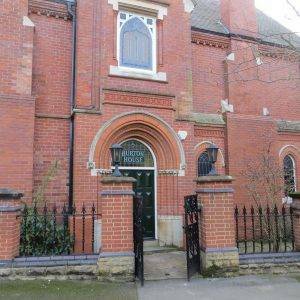 But in 2004, it was sympathetically restored and refurbished with a grant from the Heritage Lottery Fund. But the first thing you will notice today is the Sky Mirror public sculpture by artist Anish Kapoor just in front of the Playhouse. 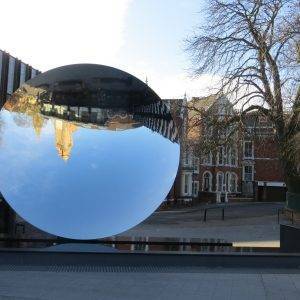 It is a six-metre-wide concave dish of polished stainless steel, weighing ten tonnes and angled up towards the sky. Its surface reflects the ever-changing environment. 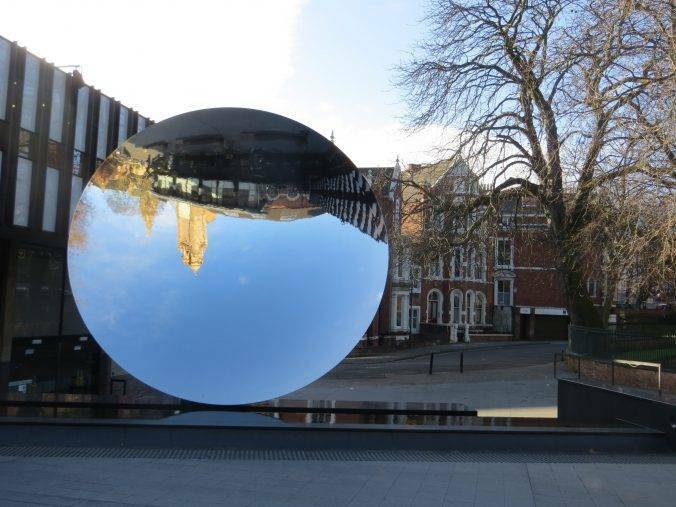 It too was the subject of much controversy when it was installed, as the mirror could focus light, in the same way as a magnifying glass, down to a particular point. As the consultant astronomer to the project said: “You need to stop the sun from falling on it in the first place. If you don’t there’s a potential danger. Any pigeon which flies through the beam could be instantly barbequed.” The solution was the erection of a sunscreen on the Playhouse roof – and to date, no barbequed pigeons have been reported. Meanwhile, it has become very popular with the public, being voted the city’s favourite landmark. Its structure appears to defy gravity, while its highly polished surface reflects a city turned upside down. From the top of Park Row, you get what for me is very much one of those ‘gosh, I would really love to live here’ moments. Personal admission: I love complicated Victorian houses, more than classic and elegant Georgian houses for some strange, inexplicable reason. 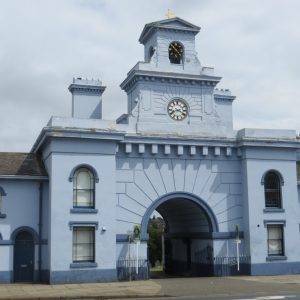 Here there are Grand Victorian mansions as far as the eye can see, carefully laid out around avenues and circuses, with tennis courts; the original gas lighting, gates to the estate and privately maintained roads. 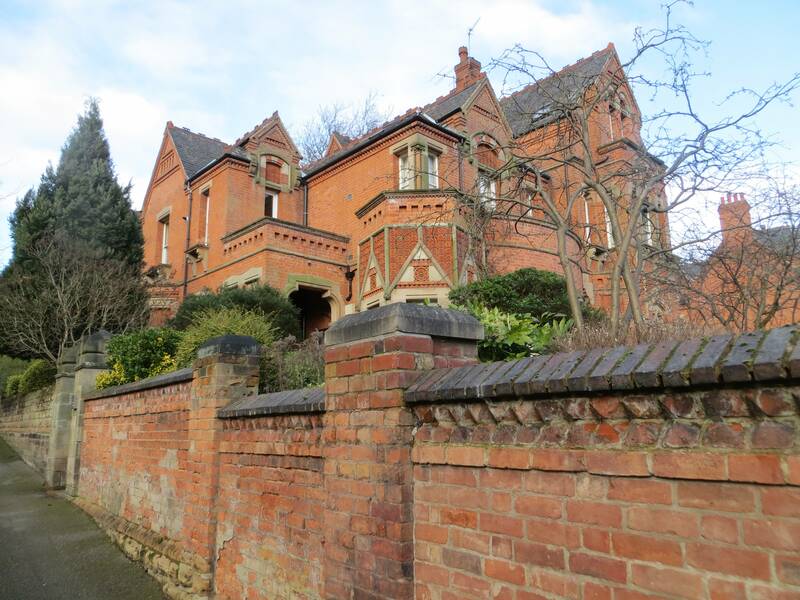 Admittedly you have to pay a ‘park rate’ as well as council tax, but I’m sure it’s worth it for this large slice of domestic bliss, right alongside a bustling city but also quite separate from it. And I notice they didn’t let the Google camera van in – there is no Google Street view for the Park Estate, so armchair rubbernecking is thwarted. The Park is one of the most complete Victorian estates I have seen in the country (the only other comparable one I can think of is North Oxford) and was built on a carefully planned basis from the 1820s onwards. 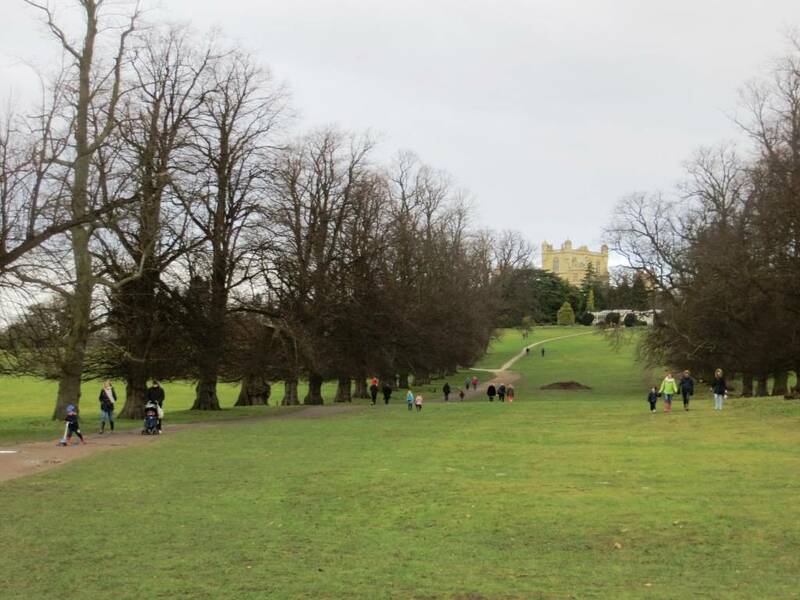 It used to be the deer park of Nottingham Castle, and its development was highly controversial, as the people of Nottingham felt that the land was for public use. 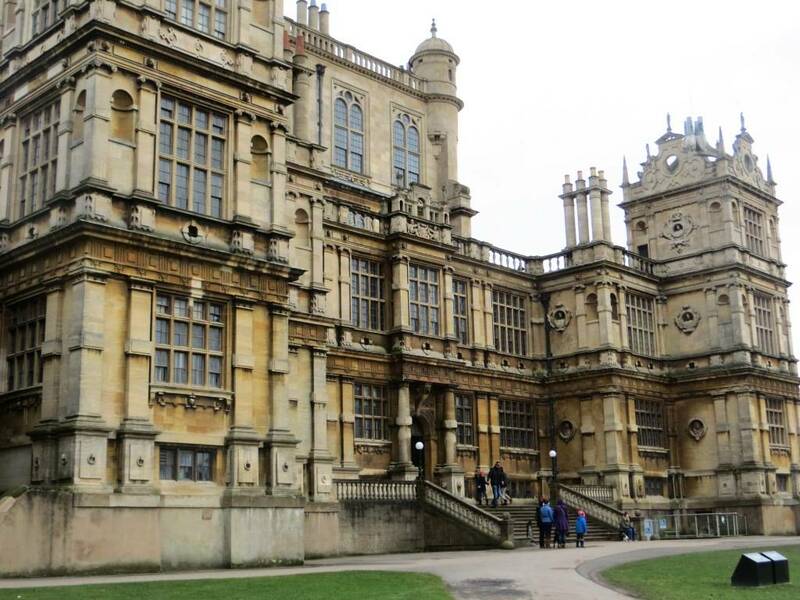 It became home to many eminent Nottingham residents, including Jesse Boot of Boots fame. After hanging around on the benches in the Circus for a while, we headed west and south, then down a small steep passage out of the Park, at the end of which we suddenly arrived back in the ‘everyday’ world, in the shape of a busy main road. Thankfully you don’t have to stay on this for long. We crossed over the Castle Bridge and then onto the canal path heading west. On the left is the bustling Nottingham Marina, now given over to leisure boats and a strong narrow boat community (a strong aroma of woodsmoke permeated the air, especially noticeable on the cold day we ambled through) but originally an unloading area for building materials, coal and agricultural tools. 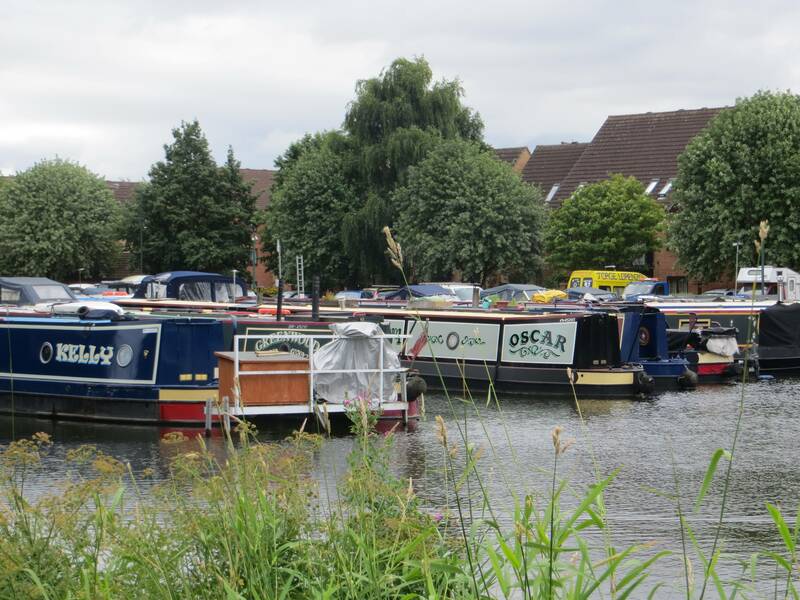 A bit further on and another waterway crosses under the canal – this is The River Leen, a 15-mile tributary of the Trent, culverted in several places as it passes south-east through the city; on another day it would make for a good exploration in its own right. You will pass by it again later in the walk. To get to the university campus area, we then crossed over Chain Lane Bridge and cut up through a residential street to reach the main road. Nottingham University underwent significant expansion in the 1920s when it moved from the centre of Nottingham to this site. 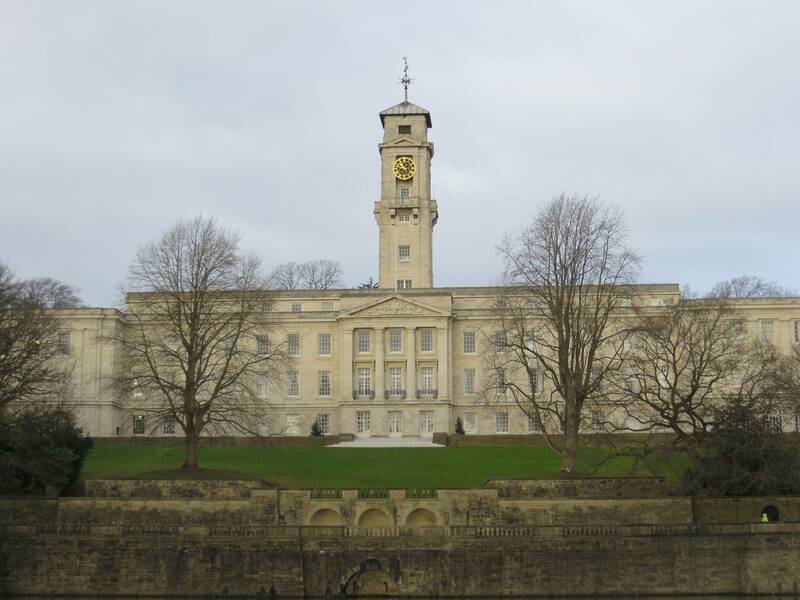 The new campus, called University Park, was completed in 1928 and financed by an endowment fund, public contributions and the generosity of Sir Jesse Boot (later Lord Trent) who presented 35 acres to the City of Nottingham in 1921. Boot and his fellow benefactors sought to establish an ‘elite seat of learning’ committed to widening participation. Very helpfully to us lovers of green spaces, Boot stipulated that whilst part of the site should be devoted to the University College, the rest should provide a place of recreation for the residents of the city; and by the end of the decade the landscaping of the lake and public park adjoining University Boulevard was completed. they’ve built a new university for a new dispensation of knowledge. I don’t think he would have been too chuffed to know that the arts centre (left in the picture) is named after him; it’s now known as the DH Lawrence Pavilion. 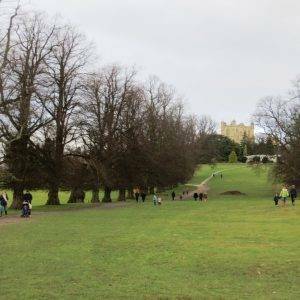 Finally, there’s a bit of a hill to climb as we headed into Wollaton Park, Nottingham’s biggest park, and the very fine Wollaton Hall, built in the late 16th century. It’s now the Natural History Museum and has a good café which makes a neat half-way breakpoint. 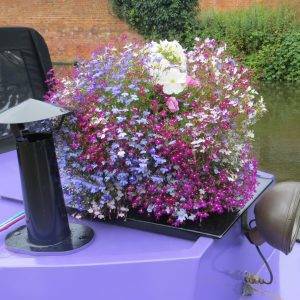 We then walked back into town, through a residential area of characteristic 1940s properties with brick-faced porches; and then back down the side of the River Leen. Eventually, the route took us back into The Park briefly before coming out onto the main road. At this point, you need to establish how much energy you have left. If tired, you can finish up now with a lovely cutback along Newcastle Drive, which gives you a final grandstand view of The Park. 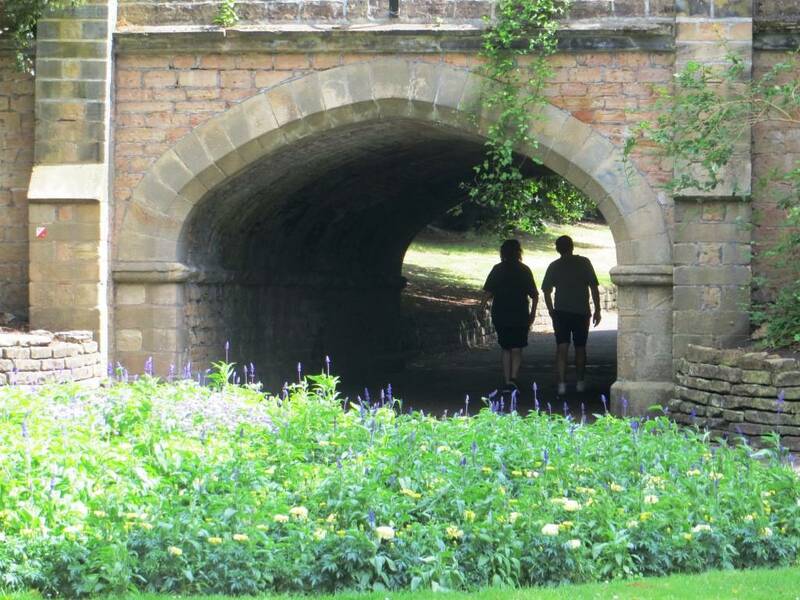 But we hope that you can persuade your walking companion to go on and visit the green spaces which relate directly to the Nottingham Enclosure Act of 1845 – a visionary project to create a green network around the growing city, to provide green spaces for relaxation, contemplation, learning, exercise and clean air. 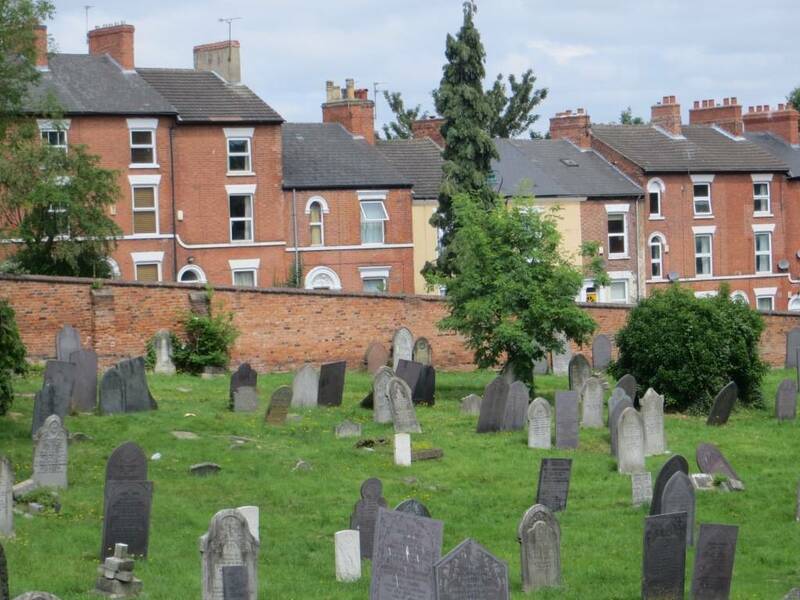 The Nottingham General Cemetery (7.4 hectares, 18.4 acres) dates from the 1830s, a time when many churchyards were becoming overcrowded, especially in towns and cities. 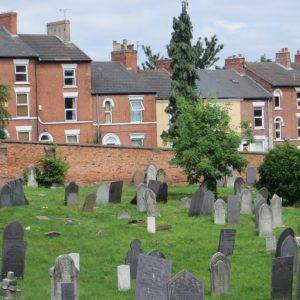 It was a vital step to take the pressure off graveyards which were becoming over full. Incredibly, by 1923 over 150,000 people had been buried in this cemetery, and it was closed to new burials due to health concerns. After many decades of neglect it has steadily been brought back into the shape it is in today; a very calming green space through which to walk, with lots of wildlife. 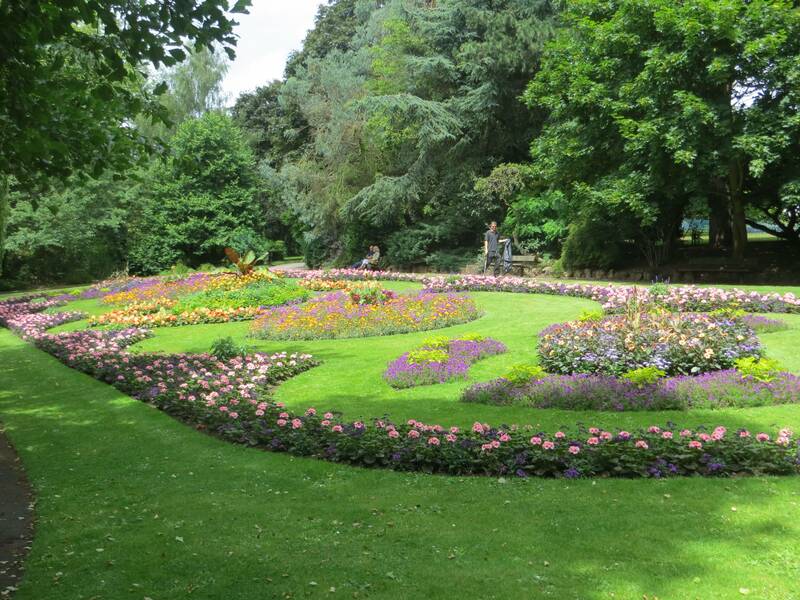 Nottingham Arboretum (6.3 hectares, 15.7 acres), almost a continuation of the cemetery, was designed and laid out in 1850 by Samuel Curtis, a botanist and horticultural publicist who had previously been involved with the layout of Victoria Park in the East End of London in 1842. 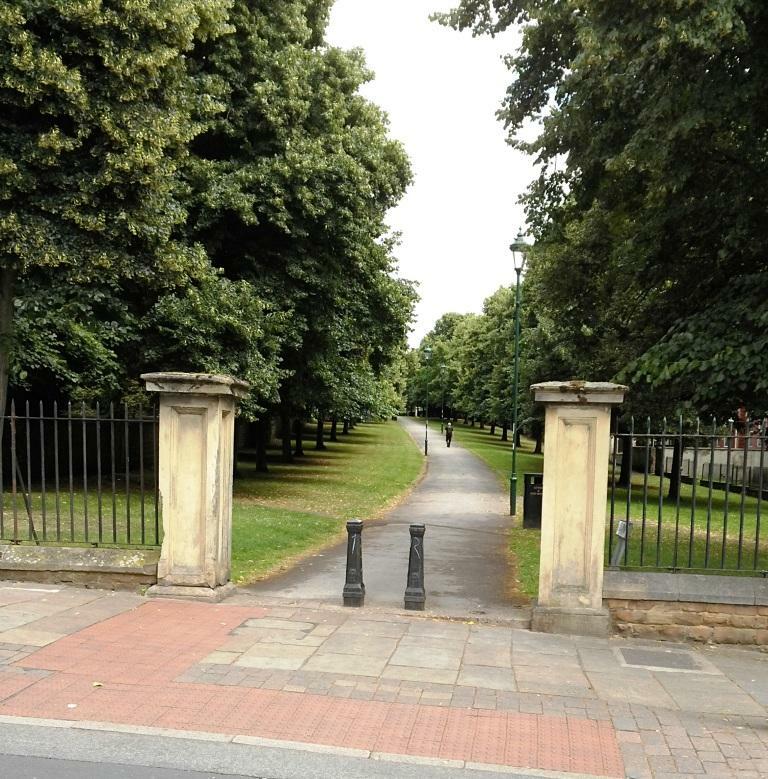 It was the first public park opened in Nottingham. 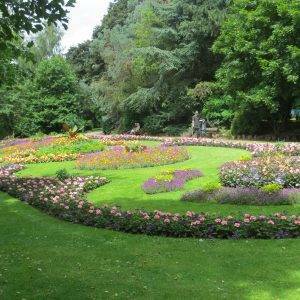 Today it is a delightful and well-maintained space and is often used for open-air events. The main aim of the design for the Arboretum was to take advantage of the landscape setting whilst providing an interlinking network of walkways and socialising areas. As a result, over 1,000 specimen trees and shrubs were planted along with winding paths and sweeping lawns. The plantings were laid out in what is known as ‘The Natural Order’ to provide an educational link to nature through botanical interpretation. Today, several of the mature trees and shrubs growing here date back to the original collection, such as the Lime Trees which were planted as nursery trees. On the right on the rise is the pagoda; around it, four guns from Sebastopol and piles of cannonballs were placed. The cannonballs were subsequently confiscated, as children enjoyed rolling them down the slopes, but the park-keepers unsurprisingly got rather bored of having to retrieve them. 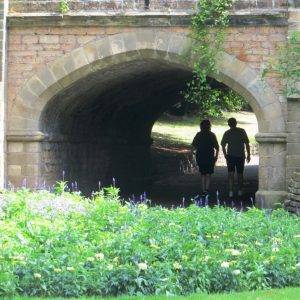 At the end of the main section of the park there is a tunnel which leads to a narrower strip of green, called Arboretum Approach, which in turn leads to a road and then, on the other side is the pleasant, shady walk of Elm Avenue, leading to Corporation Oaks and St Anne’s Hill. From the latter point, we gained splendid views of the City beneath us. In the words of a nineteenth-century commentator: “The wise policy of the Corporation in providing these stately avenues of “Elms” and “Oaks” in the midst of the crowded city is self-evident.” And so it is; green spaces amidst built-up areas. One piece of foresightedness 170 years ago, still being enjoyed every day. Exit the Arboretum, head down Waverley St, and then shortly take a right into Clarendon St; at the end of which, cross over into Vernon St and you will soon be back at the cathedral. 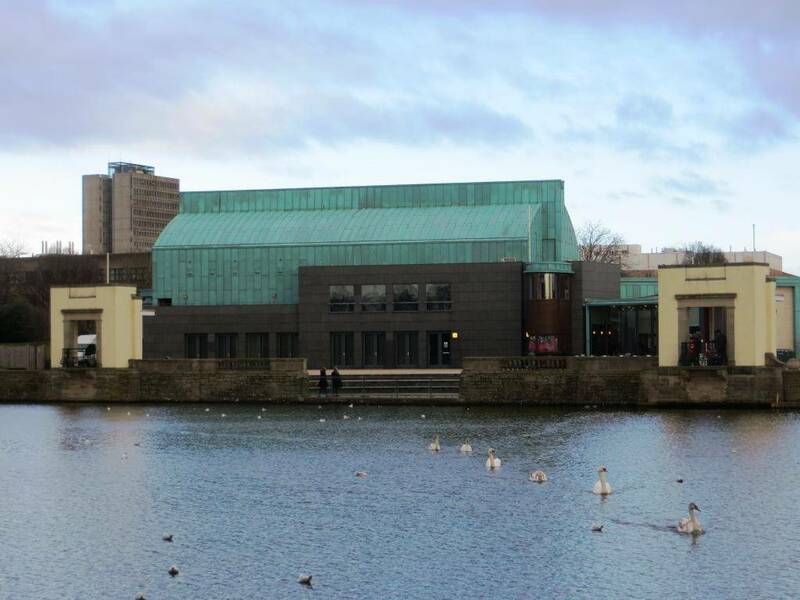 Pavilion Café, Lakeside, University of Nottingham. Great spot with lots of choices, half-way round. 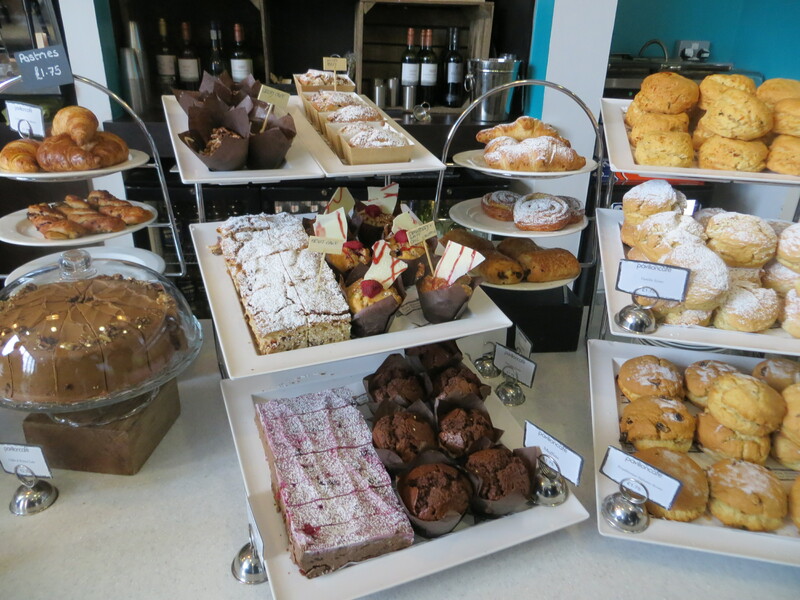 Wollaton House Café makes a good half-way break for the walk and a chance to look round the house and museum. Harts Hotel and Restaurant, Standard Hill, Nottingham NG1 6GN (Tel: 0115 988 1900, www.hartsnottingham.co.uk). Cocktails in the bar perhaps to celebrate a walk successfully completed?! And superb views over the park from the terrace garden. Ye Old Trip to Jerusalem Inn (www.triptojerusalem.com ) Claims to be England’s oldest pub, dating back to 1189AD. Just below the castle. Worth a visit if you’re feeling touristy. Delilah’s Deli & Café, 12 Victoria St (www.delilahfinefoods.co.uk). We loved this place in the heart of the city, combining as it does a traditional delicatessen with a tapas style food bar & relaxed café-style seating. 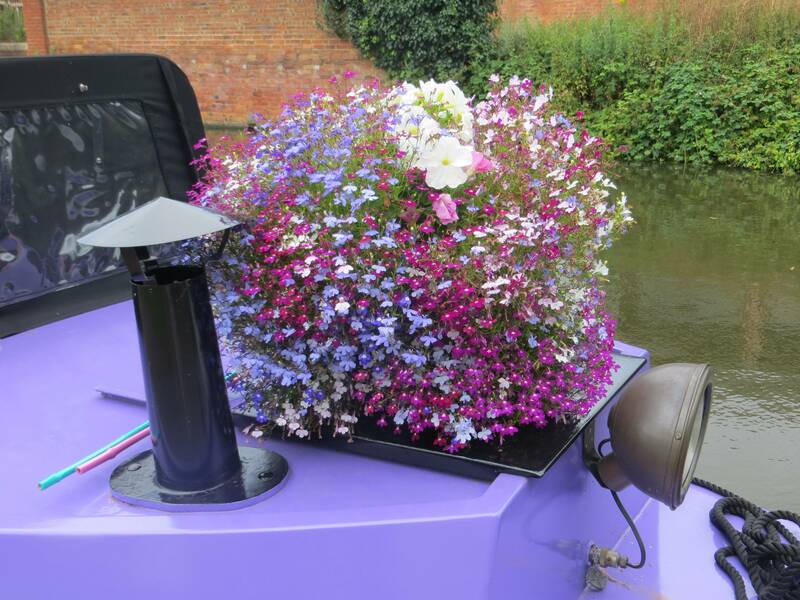 Hockley – students, vintage, independent. Nice area for cafés/drinks/meals. Recommended shops in Hockley are Ice Nine alternative jewellery, Cow retro fashions, White Rose, Wild Clothing and Montana local independent fashions. Flying Horse Walk (www.trch.co.uk) – small arcade with Vivienne Westwood, Whitewall Gallery, Atomic, Inspired. Nottingham Castle Totally destroyed after the Civil War, the medieval castle was replaced by a magnificent ducal mansion in 1674. Then in 1875, it was converted into the first municipal museum and art gallery outside London, which is still its use today. Nottingham Caves Beneath the Castle there is a labyrinth of manmade caves. Courageous kids will love them, and there’s lots of interesting history to explore. Opened in 2009 to huge architectural acclaim, The Nottingham Contemporary is one of the largest contemporary art centres in the UK. It has regular exhibitions and very much merits a visit. 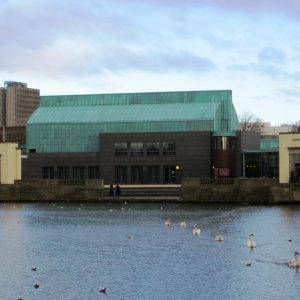 Lakeside Arts Centre is the University of Nottingham’s public arts centre and museum presenting an eclectic programme of music, dance, theatre, visual art and family events all year round. 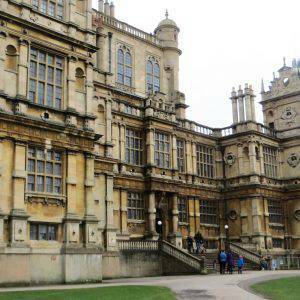 Natural History Museum at Wollaton Hall. The collection contains over 750,000 specimens of geology, botany and zoology. Explore: The Park Tunnel. You might well want to start the walk this way. 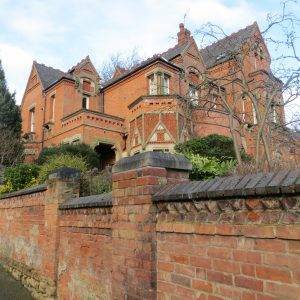 It was built in 1855 to allow horse drawn carriages access to The Park Estate from Derby Road. There’s an interesting video of it too. This is a fantastic page! 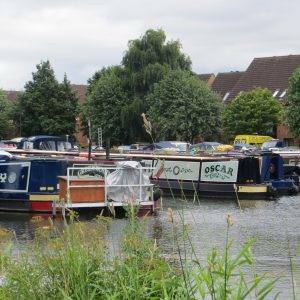 I organise an urban walking group in Nottingham and you’ve given me many more ideas here for places to include in our walks! The Park Tunnel has to be one of the most impressive architectural features, you can go down there, circle round to the Park Steps which are really steep, and then walk through Royal Standard place. Short Steps is also really fun to walk up, as well as the steps at the side of the Nottingham Contemporary. Please keep sharing any other good places for walks around the Nottingham area. I really appreciate your feedback – and am so looking forward to trying out the Tunnel, I didn’t know about it!! I live in Stamford, so not too far to come.